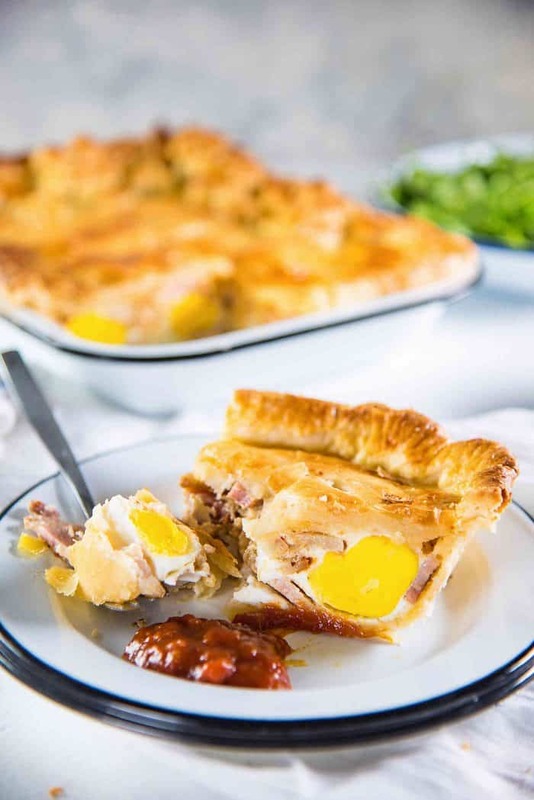 Bacon and egg pies (breakfast pies) are a New Zealand classic! 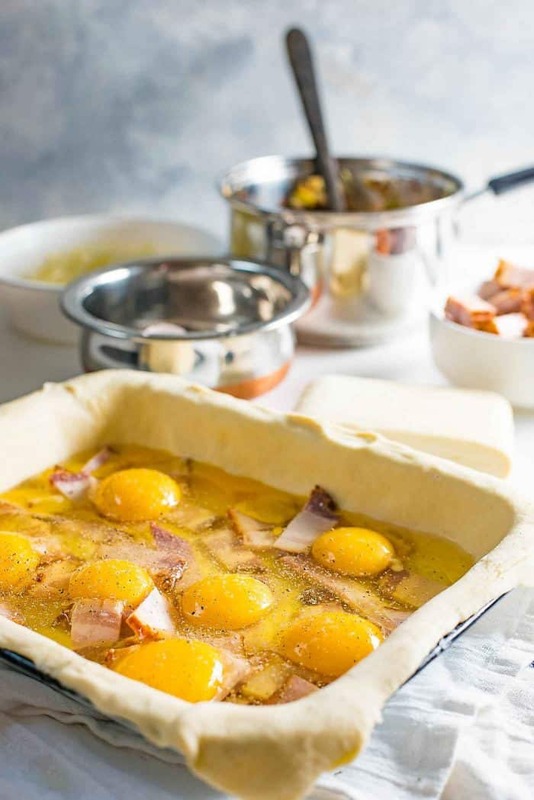 Juicy scrambled eggs, hearty whole eggs, thick smoky chunks of juicy bacon, lightly spiced flavorful soft leeks, and gooey cheese all encased in beautiful, buttery, flaky layers of puff pastry – this really is the ULTIMATE Bacon and Egg pie! 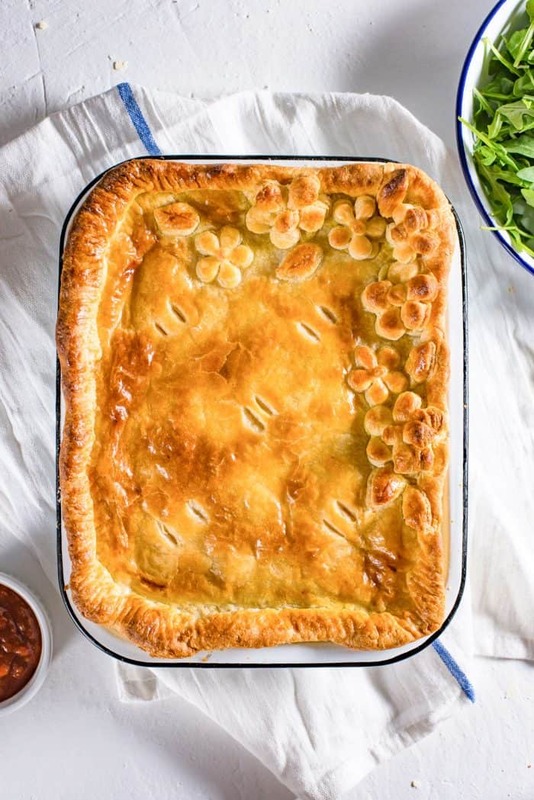 It’s a large pie that serves 4 (or 6 with a side salad), and is a great weekend brunch for the whole family! 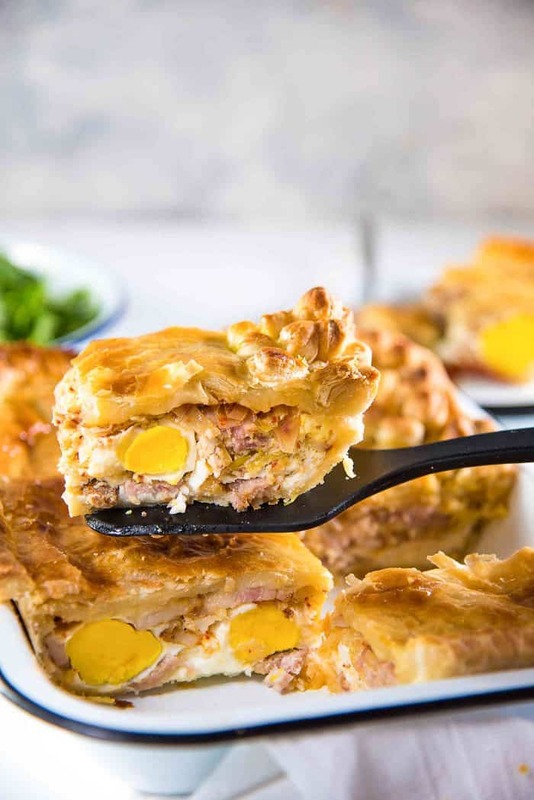 There’s nothing quite like a great Bacon and Egg Pie for this Kiwi girl! 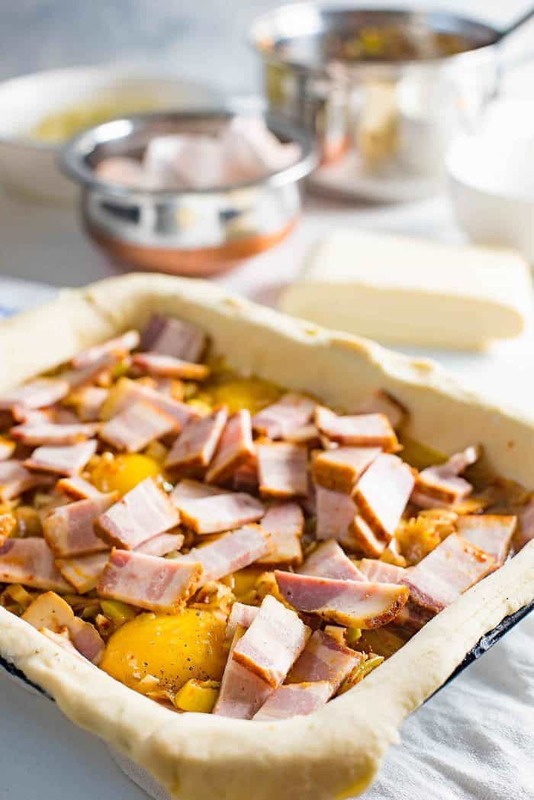 This breakfast pie is a New Zealand classic. It only needs 3 ingredients; bacon, egg, and pastry. Give me those three, and I’ll be a happy camper making these bacon and egg pies till the end of my days. 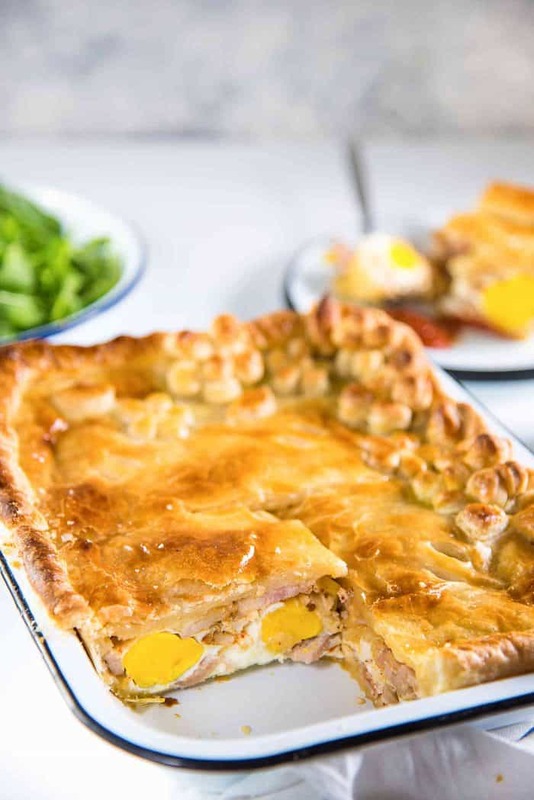 But, to make this version of my ULTIMATE Bacon and Egg Pie, you will need a little more than 3 ingredients. However, you can switch up those ingredients to make your own version of this breakfast pie. But this is my favorite cheesy, spicy bacon and egg pie version. 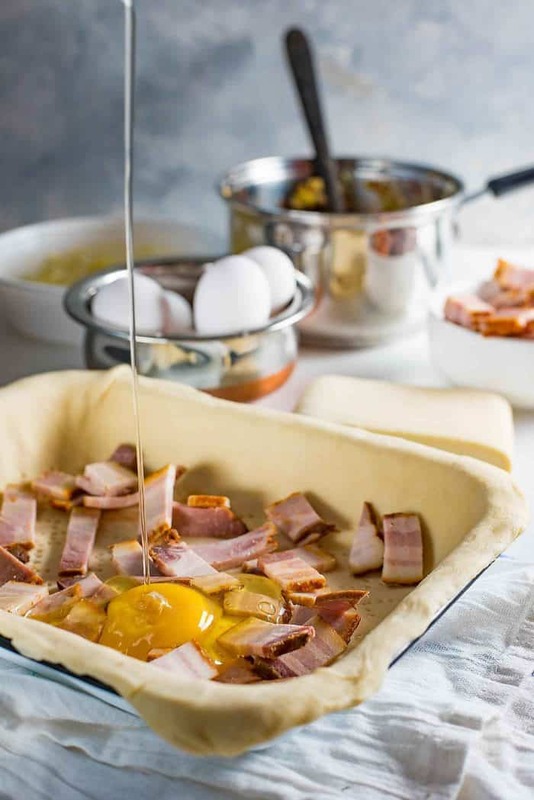 Why is this the ULTIMATE BACON AND EGG PIE? Make sure to get some good quality bacon. I bought nitrate-free, smoked, thick cut bacon. It’s so good that my hands smelt like applewood smoke for a while after slicing them up. Good quality fresh bacon goes a long way toward making these the ultimate bacon and egg pie! However, regular smoked bacon is no slouch either! I’d recommend thick cut bacon so that you get nice thick chunks of bacon in this pie. Another option is to add a couple of drops of liquid smoke to the leek mixture so that you still get a subtle smoky taste, but that’s completely optional of course. Some bacon and egg pies call for scrambled eggs, but I prefer whole eggs. However, scrambled eggs are good at absorbing flavor and juices from the bacon and leeks in this pie, so I made a compromise and added both whole eggs and scrambles eggs into these breakfast pies. So out of the 8 eggs used for this recipe, 6 were whole, and the yolks of the remaining two were broken. This gave 2 “scrambled eggs” that spread through the pie and the other whole eggs were evenly placed throughout the pie. And I do recommend free-range eggs for this breakfast pie. Yes, I add leeks to this pie! I added leeks instead of onions because leeks have a milder, sweeter taste than onions, and has a herby-vibe too. The leeks were softened with butter, garlic, Worcestershire sauce and chili flakes to add plenty more flavor. So the leeks are great way to deliver more flavors like garlic, chili and herbs in this bacon and egg pie. Just a sprinkling of cheese adds more flavor. I used Monterey Jack which melts well and has a milder taste than cheddar. If you can’t find Monterey Jack (if you live outside the US), use a young, unsmoked gouda instead (smoked gouda has a stronger flavor). The cheese adds a delightful creaminess to the pie without making it too soggy – so I really love this addition. I also made my own puff pastry for this pie, using my recipe for rough puff pastry here. 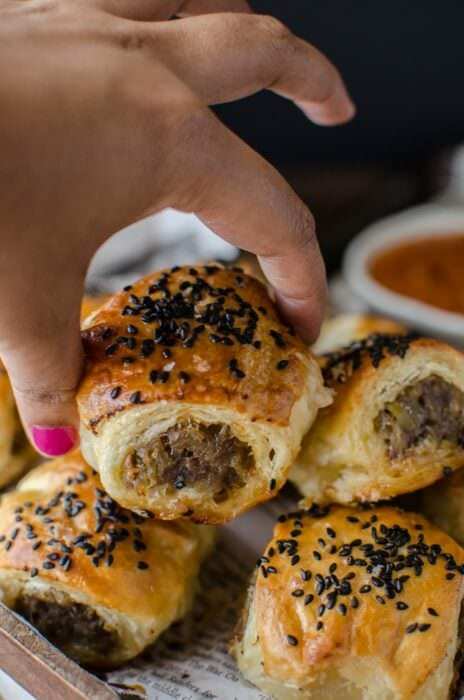 It’s a quick and easy, fantastic recipe that a lot of my readers have tried and loved, but if you’re looking to cut down on time, then I would recommend buying pre-made puff pastry instead. 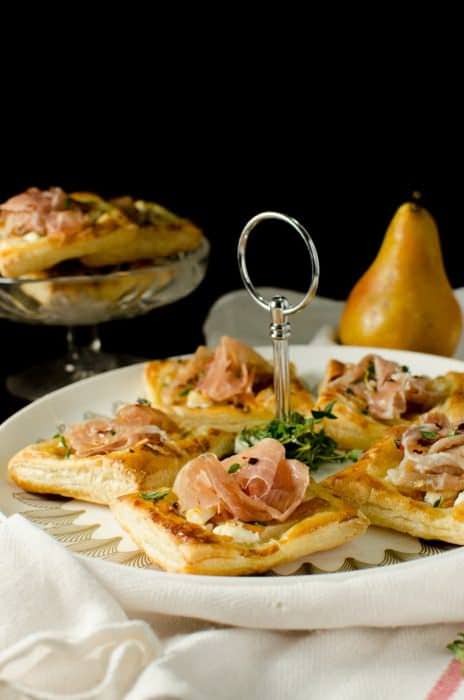 For this recipe you will need 3 frozen puff pastry sheets (about 1.5 lbs / 680 g). 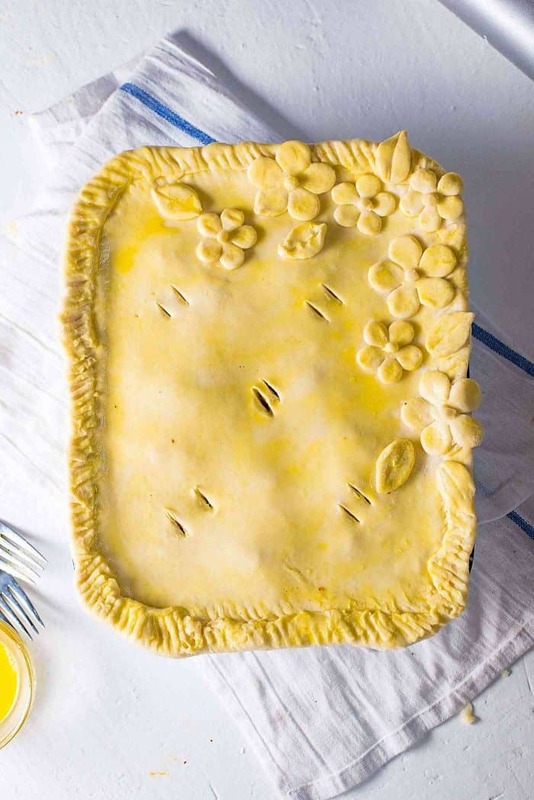 If you want to decorate the top of the pie (like I have here), you will need extra puff pastry (1 sheet or less) to cut out the shapes, but that’s completely optional. For the bottom layer, I roll out the puff pastry to about 2 mm in thickness. 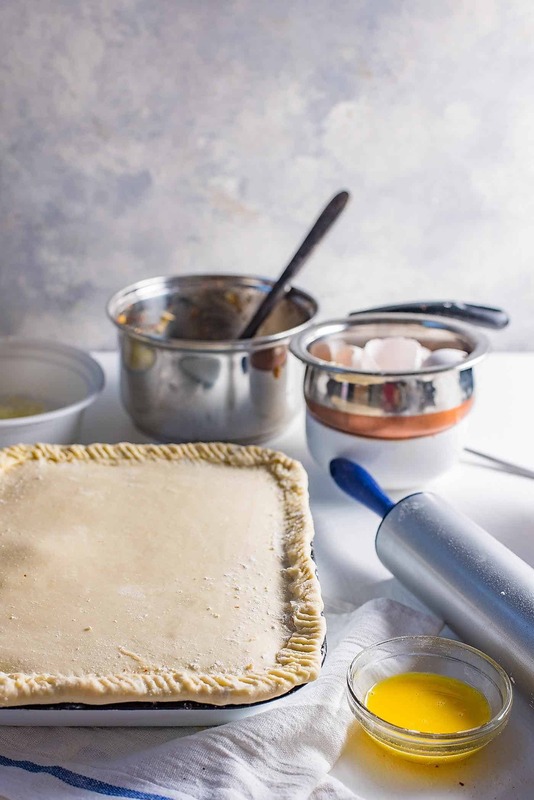 Since the pastry layer at the bottom only cooks with the heat of the pan, it is important to keep this layer fairly thin, so that it browns on the outside and cooks properly. For the top layer, I rolled out my puff pastry to about 3 – 4 mm in thickness. It’s better to keep it on the thin side as well, so that it cooks properly all the way to the center. But this layer does cook faster than the bottom layer (which is pretty obvious). But if the top browns too much, simply cover the top with foil and let it cook the rest of the way. To help the bottom cook evenly, what I like to do is to keep a metal sheet pan in the oven while it’s preheating. This way the pan heats up and retains heat before you place your pie in the oven. I place the pie dish directly on this preheated pan, so that it can directly heat up the dish from the bottom (like a pizza stone). What size is this bacon and egg pie? 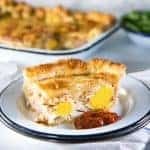 This is a family style bacon and egg pie that you can make as a slab. I used a 1.5 qt casserole dish, but you can use an equivalent pie dish too. This will generously serve 4 people. It is quite filling, but if necessary you can serve 6 people with a side salad to make it a complete meal. My casserole dish was about 10 x 7 inches and 1.5 inches deep. If your casserole dish is similar and has a volume of 1.5 qt, then this can easily be made in it. You can use an 8.5 inch or 9 inch pie dish as well. You get the best of both egg worlds – hearty full-boiled eggs, and juicy scrambled eggs. Delicious, smoky chunks of bacon in every single bite. Lightly spiced, flavorful soft leeks adding another layer of flavor along with a mild onion taste and Worcestershire sauce. 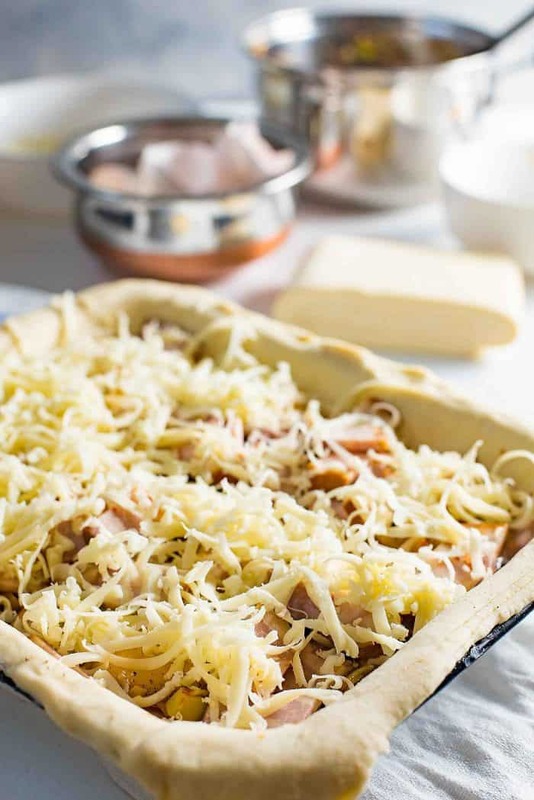 Gooey cheese that adds a delicious creaminess to the bacon and egg pie. Perfectly flaky, buttery puff pastry layers. In a saucepan, melt the butter over medium-high heat. Add the garlic, leeks, pinch of salt and chili flakes and cook until the leeks have softened, while stirring frequently. Once the leeks have softened, stir in the worcestershire sauce. Allow the leek mixture to cool down sightly. Place a heavy sheet pan in the middle rack of your oven, and preheat oven to 400°F / 200 °C. Butter a 1.5 qt casserole dish. Make sure to butter the top edges as well, since the puff pastry will puff up over the edge. Lightly dust a work surface to roll out the puff pastry. Roll out about 14-15 oz of the puff pastry on the floured surface in a rectangle shape (to fit the bottom of the casserole dish), that's about 2 mm in thickness. 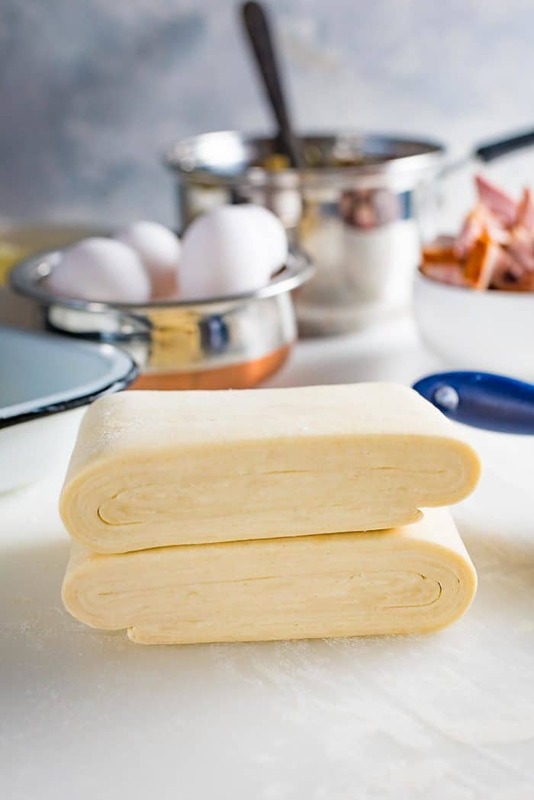 If using puff pastry sheets, place two sheets slightly overlapping each other, and roll them out until they are about 2 mm thick (and the two sheets are joined together). This will be the bottom pastry. Roll out the remaining puff pastry (or 1 sheet of puff pastry) to fit the top of the pie dish, about 3 mm in thickness. Cover with a napkin/plastic wrap and set aside. Place the sheet of pastry in the casserole dish, and gently fit it on the bottom of the dish, with the pastry hanging over the edges. Be careful not to stretch it too much as this can result in shrinking. Using a fork, dock the bottom of the pastry. Place about ⅓ of the bacon on the bottom of the pie. Break 2 eggs into the pie dish and using a fork, break the egg yolks and spread the eggs on the base of the pie dish. Break an extra egg, but reserve the egg yolk in a separate bowl, add the egg white to the pie. Break in the rest of the eggs into the pie, while evenly spacing them through the dish. Sprinkle some salt and pepper on top. Dollop ½ of the leek mixture over the eggs, followed by the rest of the bacon, then the rest of the leeks and finally the grated cheese. Sprinkle a little salt and pepper over the cheese. Brush some water around the edge of the pie, and place the top pastry to cover the casserole dish. Press the edges gently to seal. Roll the excess to create a ridge along the edge of the pie, and crimp it using a fork to completely seal the edges of the pie. Mix the extra egg yolk with about 1 tbsp of water and whisk to combine. Brush this egg yolk over the surface of the pie. Cut extra decorations (optional), and place them on top of the pie. Brush the decorations with the egg wash as well. Make 5 slits in the pie carefully (to avoid piercing one of the eggs). Place the pie in the preheated oven, on top of the preheated baking tray. Lower the heat to 375°F/190°C, and cook for about 50 minutes. Check the pie after 20 minutes, rotate the pie if necessary and check every 10 minutes afterwards. If the top looks like it's going to burn, cover with foil. When the pie is baked, remove it from the oven and let it cool down. Slice and serve while warm or at room temperature. Serve with tomato ketchup or tomato relish. 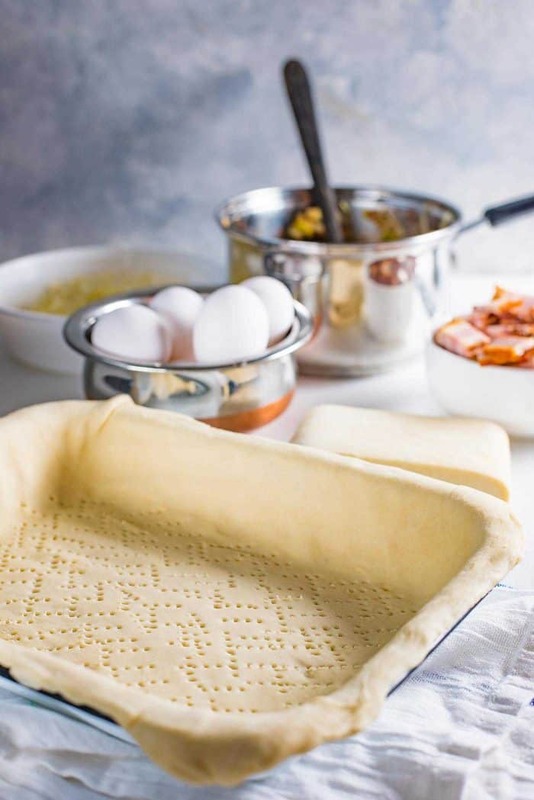 If you liked this ultimate bacon and egg pie (breakfast pie) recipe, don’t forget to subscribe for new (and free) recipes by entering your email address on the side bar (and get all these recipes delivered straight to your inbox), so you don’t miss out on a thing. You can find me on FACEBOOK, TWITTER,INSTAGRAM, PINTEREST, YOU TUBE and GOOGLE-PLUS too. WOW, I am seriously trying this one out. Maybe tomorrow already. I love it! This looks absolutely PERFECT. I love the flavor combo, the pastry looks to have the absolute perfect sturdy yet flakey texture, and your presentation as always is impeccable. This looks insanely good!! It’s all my favourite breakfast items wrapped into one amazing pie! Yum! Those flowers on top are so so pretty!! A beautiful way to present breakfast to a crowd!